Living: The bavarian mountain hound is not suited for city life. he needs space and exercise. 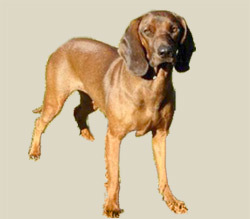 The Bavarian Mountain Hound"s head is strong and elongated. The skull is relatively broad and slightly domed. It has a pronounced stop and a slightly curved nosebridge. The muzzle should be broad with solid jaws, and its lips fully covering mouth. Its nose is black or dark red with wide nostrils. Its ears are high set and medium in length. They are broader at the base and rounded at the tips, hanging heavily against the head. Its body is slightly longer than it is tall and slightly raised at the rump. The neck medium in length, strong, with a slight dewlap. Topline sloping slightly upward from withers to hindquarters. Chest well-developed, long, moderately wide and well let-down with a slight tuck-up. It has a long, fairly straight croup and solid back. While its tail is set on high, medium in length and hanging to the hock, carried level to the ground or hanging down. Bavarian Mountain Hounds are calm, quiet, poised and very attached to their masters and family. When hunting, they are hard, single-minded and persistent. Courageous, spirited, fast and agile, they are at ease on a rugged terrain, with a superb nose and powerful hunting instinct. They need a patient, experienced trainer. The Bavarian needs a considerable amount of exercise. It is unadvisable to allow him to roam off-lead as he is an ardent tracker and his nose may lead him into trouble or danger, but if a securely fenced area can be found for him to run and explore this will keep him mentally alert and satisfied as well as meeting his physical needs. Otherwise he should be given long daily walks on lead to keep him fit and to provide interesting sights and scents for his mental well-being. Tracking is the obvious canine sport for this breed. It will provide him with exercise and allow him to do what he has been bred for decades to do - follow his nose. The coat is short, thick and shiny, lying very flat against the body and moderately harsh. It is finer on the head and ears, harsher and longer on the abdomen, legs and tail. Its coat can come in all shades of black-masked fawn or brindle.